The Microgroover is a major accessory tool for creating coating incisions for film thickness measurements with the Tooke Paint Inspection Gauges. 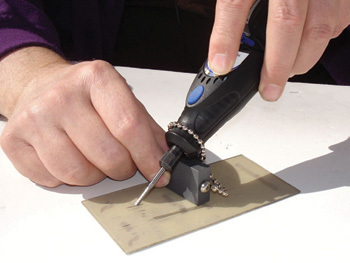 This tool greatly extends the range of the measuring technique to include almost any coating on any substrate. The Microgroover is especially effective on hard and brittle (concrete) materials, as well as soft or elastomeric (rubber) substances. In addition, fibrous composites are incised easily and cleanly. Aside from film thickness measurements, small-scale operations of cutting, grinding, sawing, and polishing can be performed with this useful cordless power tool. The Microgroover is a high-speed rotary tool for creating the small, almost microscopic, incisions required for measurements with the Tooke Paint Inspection Gauge. This technique completely eliminates the deformations of coating and substrate which may occur when conventional gauge cutting tips are used. The high-speed cutter, usually with either tungsten carbide or diamond-studded surfaces, “erodes” away surface material in a precise pattern, leaving adjacent and underlying areas totally undisturbed. Hard, brittle, tough, fibrous, tender, or elastomeric materials exhibit clean, nontearing, controlled disintegration under the rotary cutter. Carrying Case: Flexible plastic, 2"x2"x8"
The Grinder unit is the Dremel Minimite Model 7300 Cordless Rotary Tool. It comes in a plastic carrying case that can be attached to the Paint Inspection Gauge carry case. It is furnished complete with charger, and with special accessories for grooving operations. The Microgroover adaptation utilizes drill-like grinder tips for groove cutting operations (cylindrical face cutting). This cutter may be used in place of the MG402-02 Cylindrical Carbide Cutter supplied with the MG402 MICROGROOVER. The advantages of the conical cutter are twofold. First, it makes the minimum possible “footprint” on the work surface. Second, it is capable of setting to “X” values well above 4X. Thus it is clearly preferred for use on thin films (< 1 mil) and on curved surfaces. This cutter has a pointed tip with a conical cutting surface having a solid angle of 30 degrees. The material is tungsten carbide. It is used similarly to the cylindrical tip, but with varied protrusions of the cutter in the chuck.